Our school is adopting the Next Generation Science Standards for the first year, and it is definitely keeping me on my toes. I have been learning all kinds of fabulous science right along with my 1st grade friends. One of our first standards for the year is exploring patterns in seasons and sunlight. 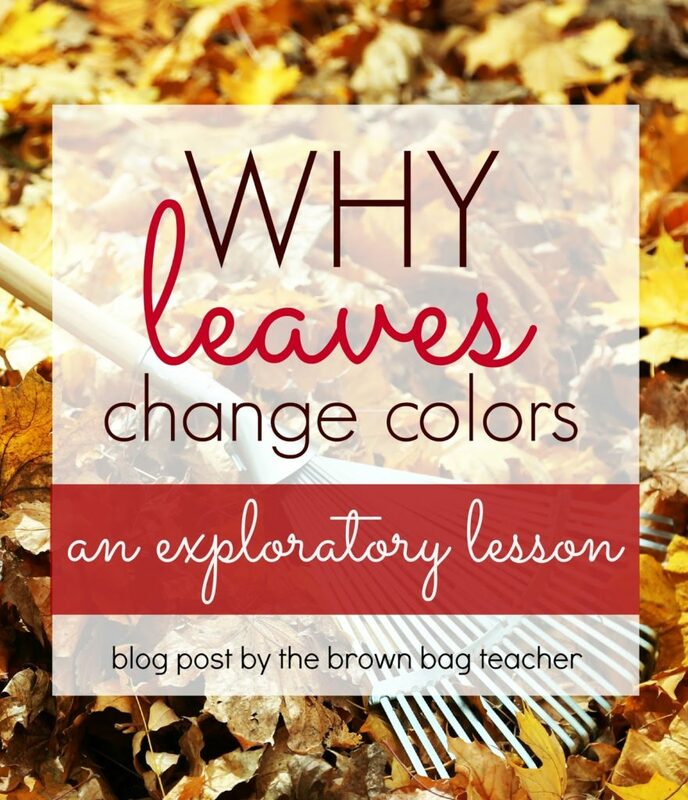 With the start of Fall last Wednesday, it was the perfect time to talk about the shorter days and longer nights of fall, as well as, answer one of our most-pressing 1st grade questions – “Why do leaves change colors?” We began our Fall and Leaf study by collecting leaves from our own homes and sharing them with our friends. The afternoon before I commissioned my Leaf Hunters, we enjoyed We’re Going on a Leaf Hunt together. 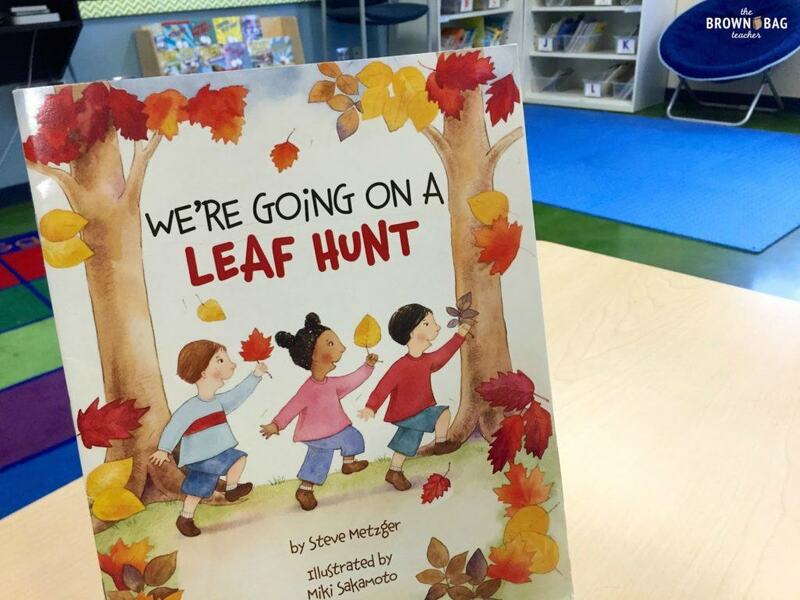 Put to the familiar tune of “We’re Going on a Bear Hunt”, “Leaf Hunt” it was a simple and fun way to introduce many different types of trees and leaves, as well as, put our learning in context. 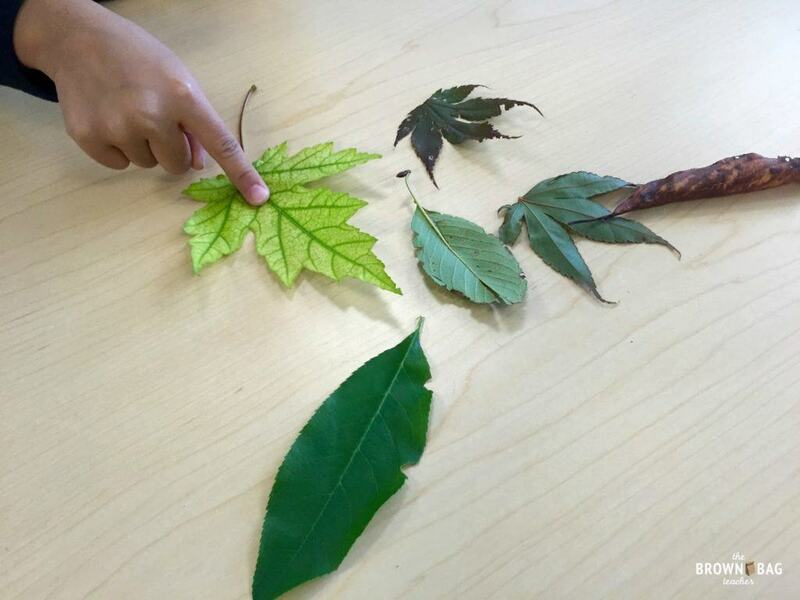 The next afternoon, we spent our theme time exploring and investigating the leaves my friends brought to school. 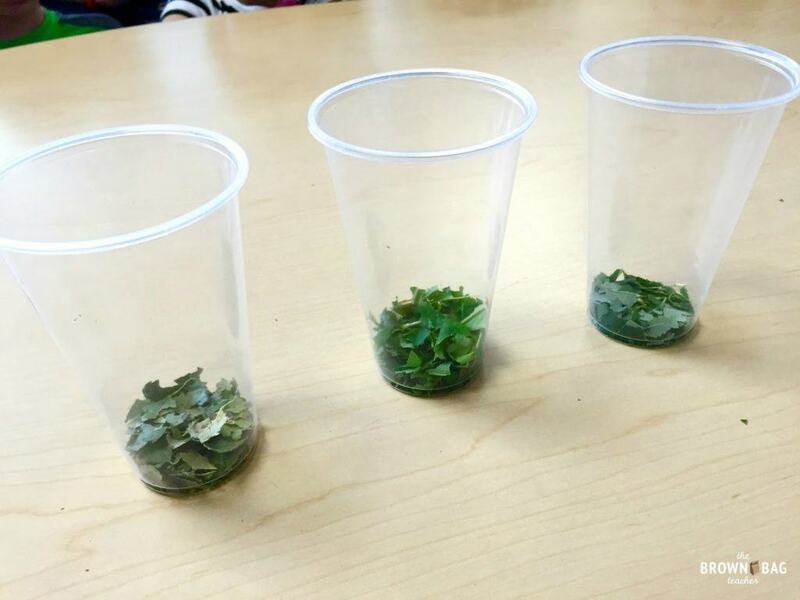 I placed 5-6 leaves on each of our tables and students carouselled around the room observing the leaves and touching them (with only 1 finger, so we didn’t crush someone else’s leaf). 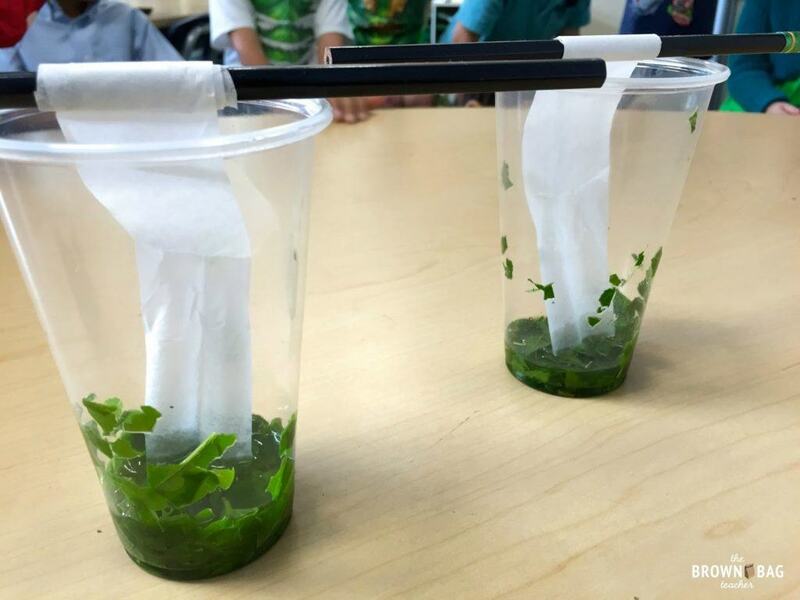 We then measured the leaves with cubes (non-standard measurement is a 1st grade standard) and we did some casual experiments with leaves and water (do they float? do they sink?). After we observed the leaves, we brainstormed adjectives to describe the leaves. We are learning how to use our 5 senses to write narratives, so using adjectives to describe our leaves was a perfect science-writing connection. 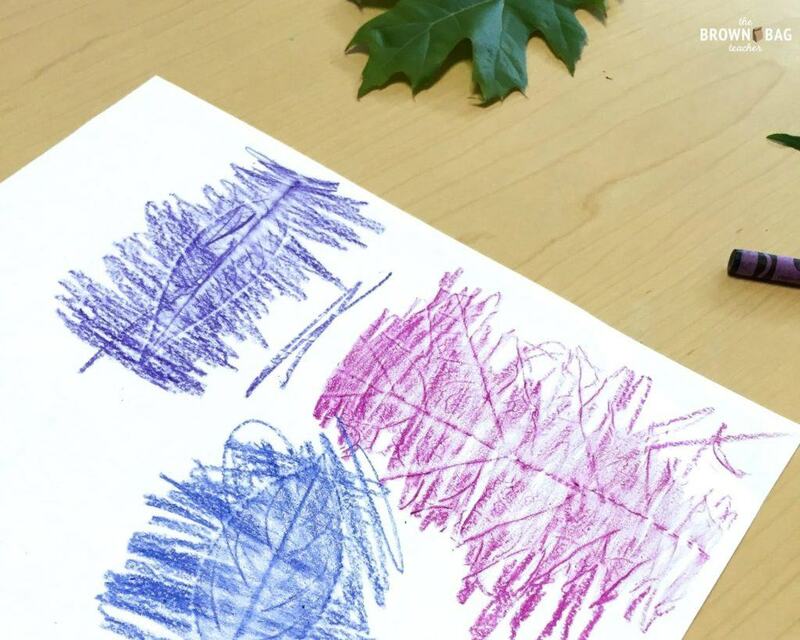 Rather than illustrating our leaves (which would definitely test our artistic abilities), we did leaf rubbings. WARNING – Children born in 2010 have never done leaf rubbings before!!!!!! My little KC asked me – “Can you do this on the iPad?” #facepalm If you decide to do rubbing be completely prepared with ample amounts of patience and a step-by-step plan for how to do a rubbing. 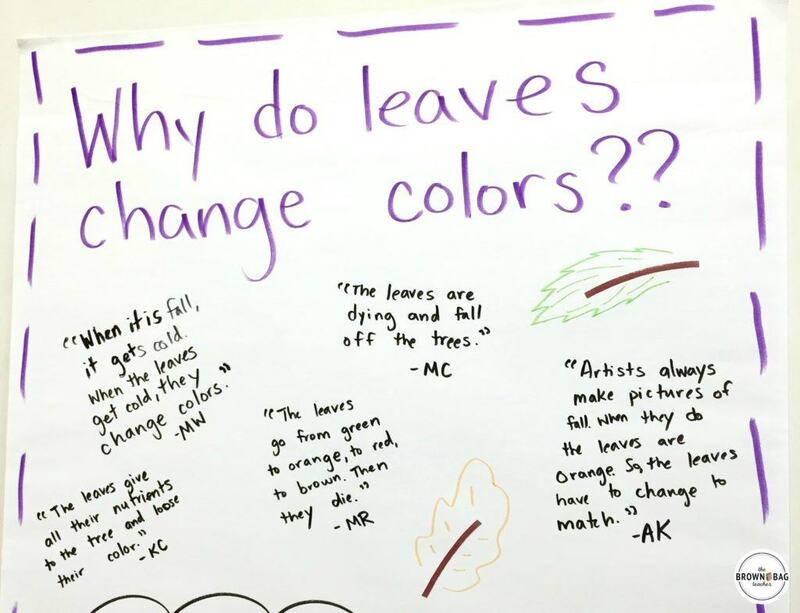 Learning about predictions in reading, we shared our ideas about why leaves might change colors. The friends below were fairly confident of their thinking and shared their ideas with the class. FRIENDS – 1st GRADERS ARE UNINTENTIONALLY HILARIOUS. 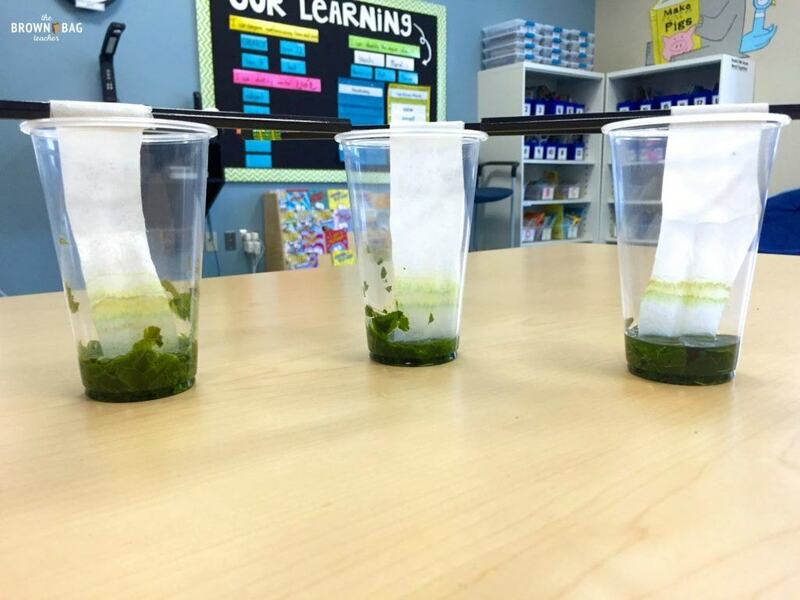 Hoping to answer our question, we set-up a lead chromatography experiment…1st grade style! 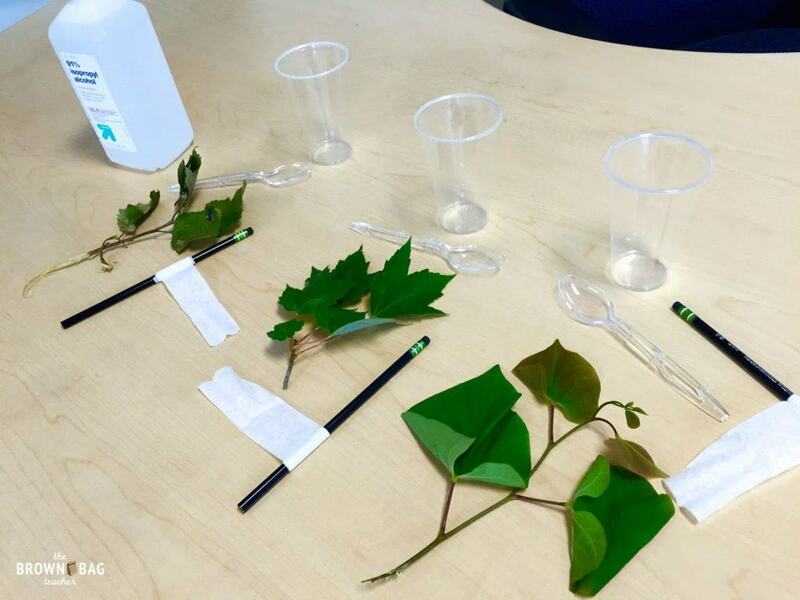 I collected 3 plastic cups and 3 sets of leaves (4-5 leaves from the same tree in each set). 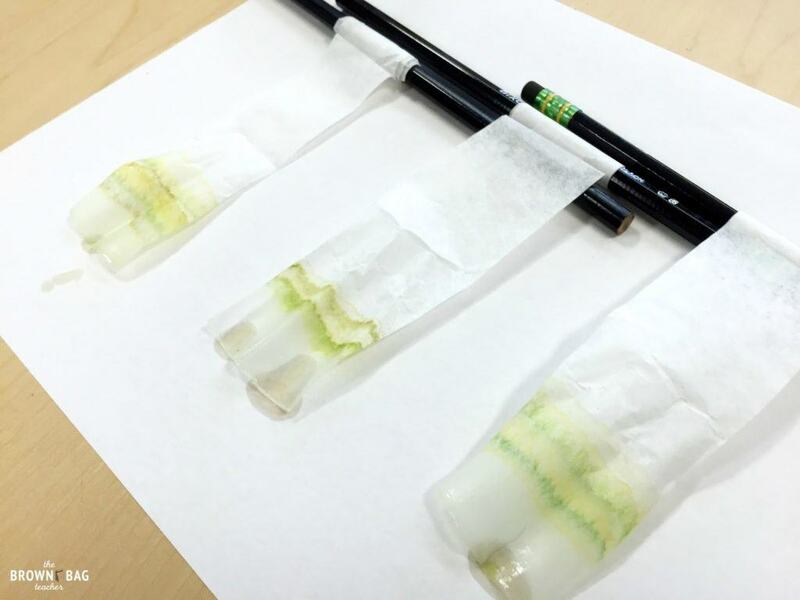 Then, I snagged pencils and coffee filters to act as our chromatography paper, plastic spoons for mashing, and rubbing alcohol for chemical in charge or extracting pigment from the leaves. We split into 3 groups, each group responsible for tearing their leaves into tiny pieces and putting the pieces in their cup. To each cup, I added just enough rubbing alcohol to cover all the leaves. I did do this part of the experiment myself because I did not have goggles or gloves for my 1st grade friends. Although rubbing alcohol isn’t likely to kill one of my 1st graders, I would much rather err on the side of caution. 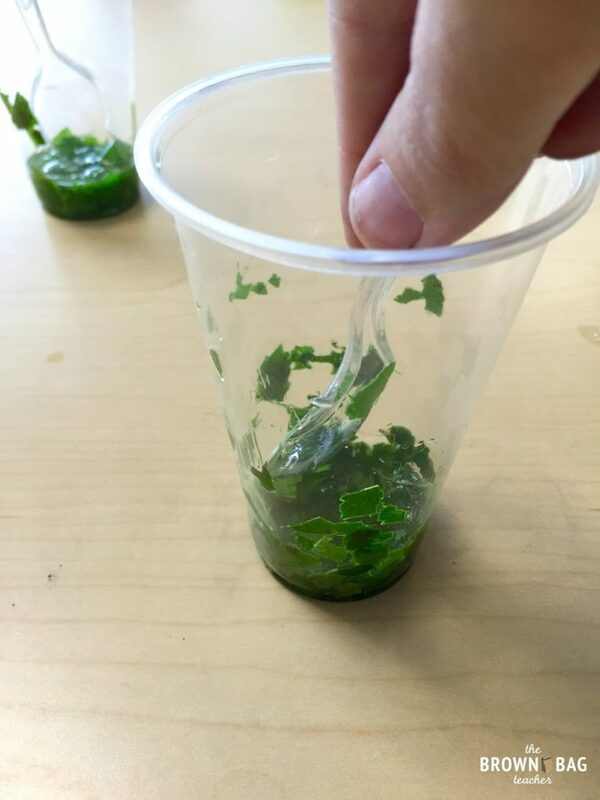 After the rubbing alcohol was added, I mashed the leaves in each cup with a plastic spoon. While I was mashing each cup, we sang some of our favorite songs (Learning Station Days of the Week, Twin Sisters Learning our Short Vowels, Ron Brown Nouns and Verbs)…which means I mashed each cup for approximately 2 minutes. By the end of the mashing, the rubbing alcohol should be a light green. This is the most important step because it releases the pigments so they can travel through the coffee filter! We cut a long strip from the middle of a coffee filter and taped/wrapped it around a pencil. We then put the paper strips into our leaf/alcohol mixture! For a better visual, we laid them flat on a white piece of paper and put it under the Document Camera. Then, students picked one of the strips to illustrate and describe in their journals. Observing our chromatography strips, we realized that different colors had been in the leaves after all! We were able to see green, yellow, and brown in our leaves (even though the leaves only looked green at the beginning of the experiment). But now, we needed an explanation. How can a leaf have all of those colors inside but still look green? 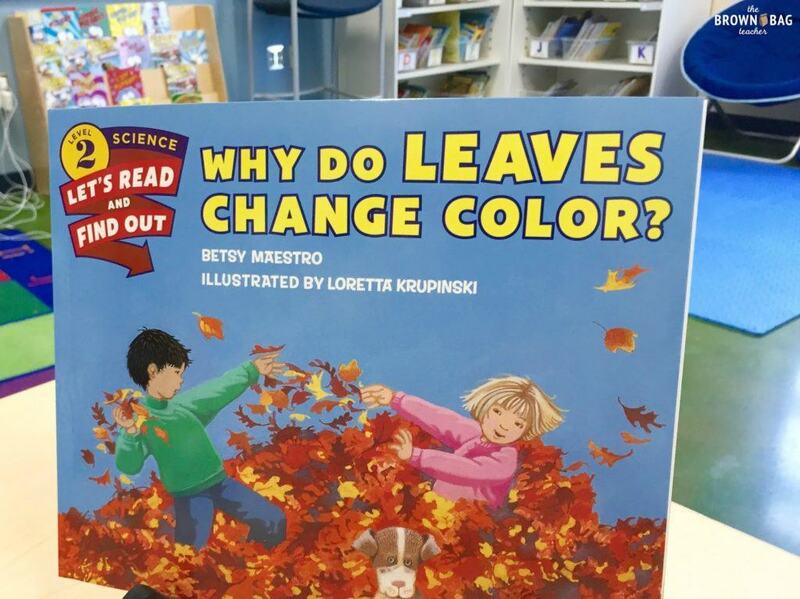 To explore this question, we read Why Do Leaves Change Colors by Betsy Mastero. This is a book perfect for primary learners – lots of science and explanations but not enough to overwhelm or confuse! 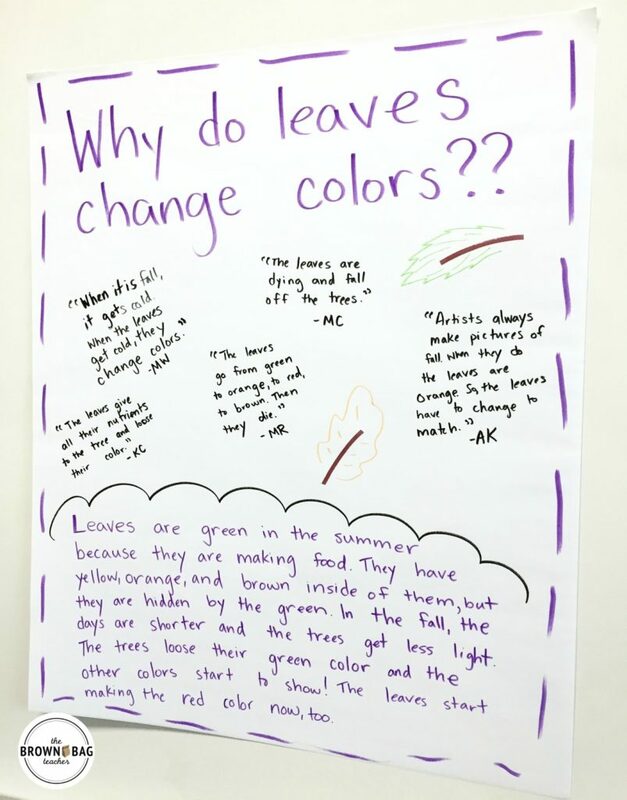 After reading the book together and making the connection to our chromatography strips, students went back to their writing journals and wrote their own explanations for our guiding question – “Why do leaves change colors?” Then, we came back to the carpet and wrote a class definition. 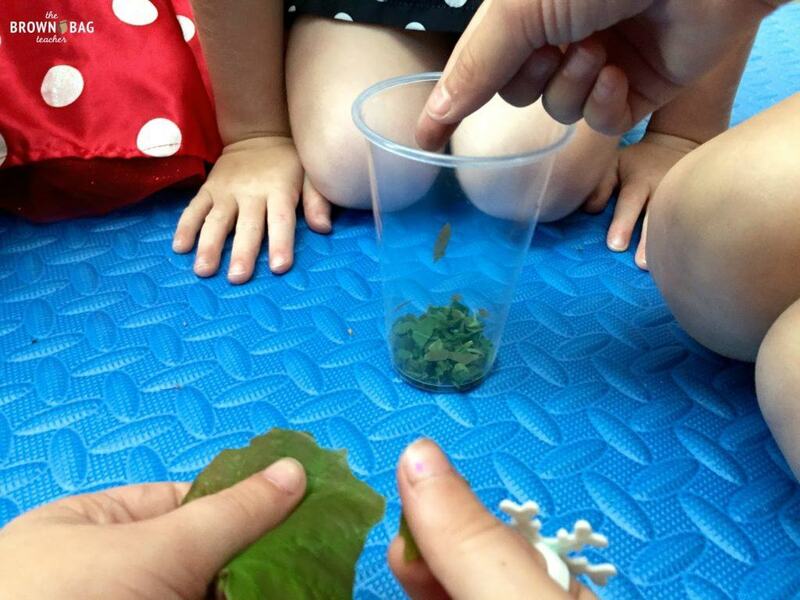 We learned that during the summer months, the leaves are making food which makes the leaves look green. This green color hides the other colors in the leaves. During the fall, the leaves get less light so they are not making as much food, and the leaves loose their green color. As the green color becomes less, the other colors in the leaves start to show. This is pattern that continues each season! This was a simple way to make a huge impact. Plus, it made our world a little more magical – who doesn’t love knowing that leaf colors are ‘hiding’ until the onset of Fall, when our world becomes considerably more colorful! What are your go-to science lessons for demystifying fall? I’d love to hear your ideas! WOW! 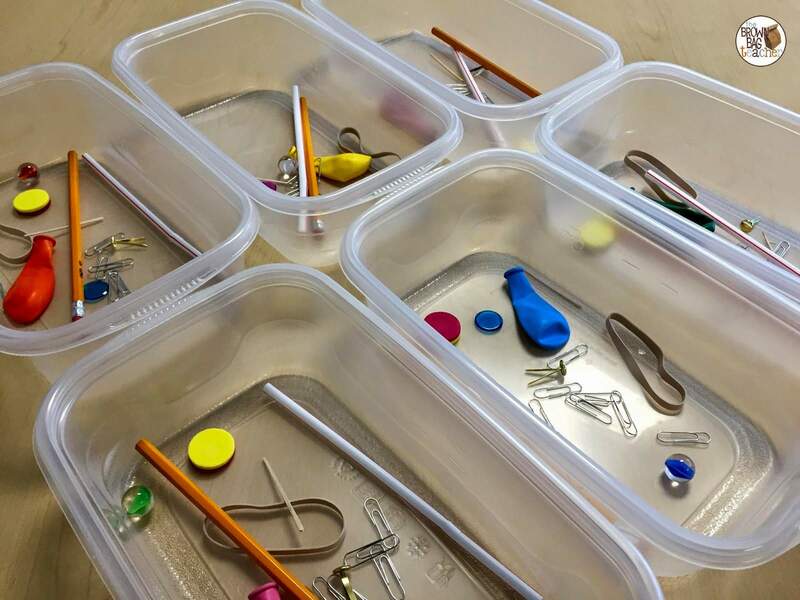 …coming from a teacher (ME) who is deathly afraid of science…this looks like a BLAST! Going to step out of my comfort zone and give it a try! Thanks!!! 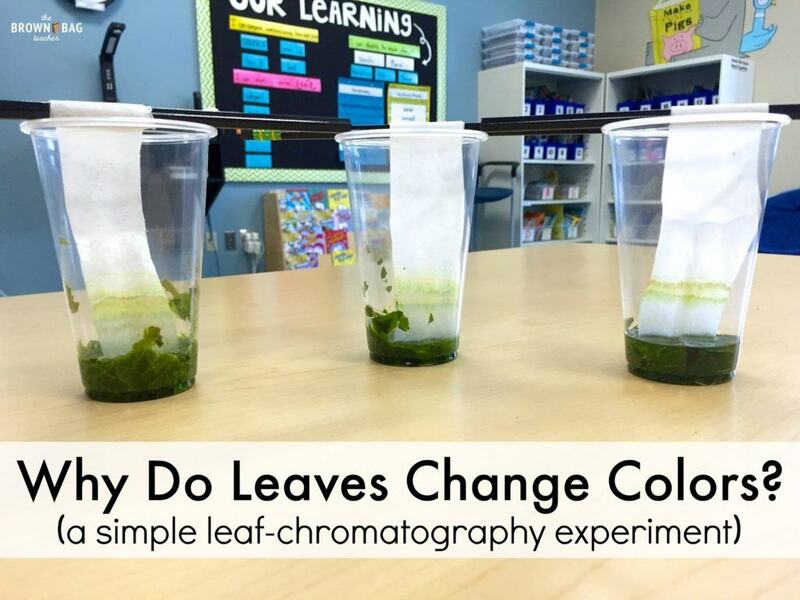 My kids and I have been talking a lot about leaves…this is the perfect experiment for us to try! You are an amazing teacher!! Coming from middle school, and then 5th and 4th, you have helped me so much with figuring out how to teach my firsties! Thank you! Thank you for your fantastic holistic leaf lesson. I am going to use this in my first grade class tomorrow and Thursday. Cross your fingers that our leaves work as well as yours. I appreciate how simple, yet perfectly rounded your ideas are.